Sometimes bikers have winter projects going on in their garage, this year I'm working on some guitar projects. I'm not a luthier, so don't get mad. These frets were stubborn, with a barb that extended the length of the fret, but they had deep string notches in them so they had to be replaced. The guitar is a Kent Lido, maybe from 1965. Mostly in good shape except the nut grooves were too deep and that led to string notches in the frets. I have no idea how it will sound, except that it has 2 single coils with hefty magnets, and a mahogany body. It was built as a beginners copy of the Stratocaster. I'm intending to use it for slide. I was looking at your project and thinking, "What a great start for a fret less guitar." Just fill the slots in with with plastic wood so they show, sand lightly and start playing. If I were a slide player I suppose I would go that way since I often spend way more time an projects than they will ever be worth in the end. Does anybody play a fretless guitar? They sure do. And the guitars are rather pricey at that. So why would that be who knows? .... go figure. More money for doing less. Must have been a union contract clause. If you do a Google search for fretles guitar players they may show up. I heard about a couple of them by name while the Watering Hole was still a forum. Everyone seemed impressed, but who really knows why. Was it because they were actually good, or if the thought of the challenge impressed them. I am running at 44bps line modem. It barley keeps up with my one finger typing. So no YouTube for me. It would take half the day for me to load it. Anyway, they are out there in Cyberland. And on YouTube also. What are you doing on 44 BPS? When I went online in 1987 I had a 1200/2400 BPS modem, and while there were still 300 BPS portals around, 1200 was the standard up into the early-mid '90s. This sample I like, but I don't want a fretless guitar for myself. A fretless guitar would be too much for me. Great musician, but I don't think it sounds as nice as all the fretted guitars we love. I have 2 fretless bass', an acoustic Michael Kelly Club Custom and an SX Jazz Bass. I defretted both myself and I love 'em, however I get a sore neck playin' a fretles bass because I have to keep my eyes on the fingerboard, with fretted I don't have to stare to know I have the right fingerpoint. OOPS I meant to type 44K bps, but I always forget that. I just figure peeps would know what I meant. I should have known better. I have been a tech all my life ... at least up to this point in time. Being snowed in is a real bummer. 7' drifts all around here and more snow in the forecast the whole coming week. I have two Strats to do yet from my out of control browsing at Warmoth. Finished the necks already and painted them. Need to slot the nut. One body is painted and ready to go. The other was my favorite Strat and I started to wear through the finish at a couple of points so I took it down slightly and am going to put another coat on it. But I just don't want to get involved. Funny, after I jump in I always wonder why not sooner? But I am a master at procrastination. Just like my music. I wrote over 30 songs the last year or so. I have only put about 1/3 of them on my DAW up to date. But at least I started posting a few. Wow. After proof reading this and seeing how much I have to do I think I'd better sit back in my recliner and watch a movie. And think about the stuff I need to do during the commercial breaks. Buffalo_Bill wrote: These frets were stubborn, with a barb that extended the length of the fret, but they had deep string notches in them so they had to be replaced. 1. Pack the sawdust into the divot you want to fill. 2. Pour in a little glue. Let dry enough to be solid. This is so the glue in the next step won't leak out everywhere. 3. Fill in with more glue. Let dry. 5. You may need to re-cut the fret slot. You won't be able to tell the difference for small spots. 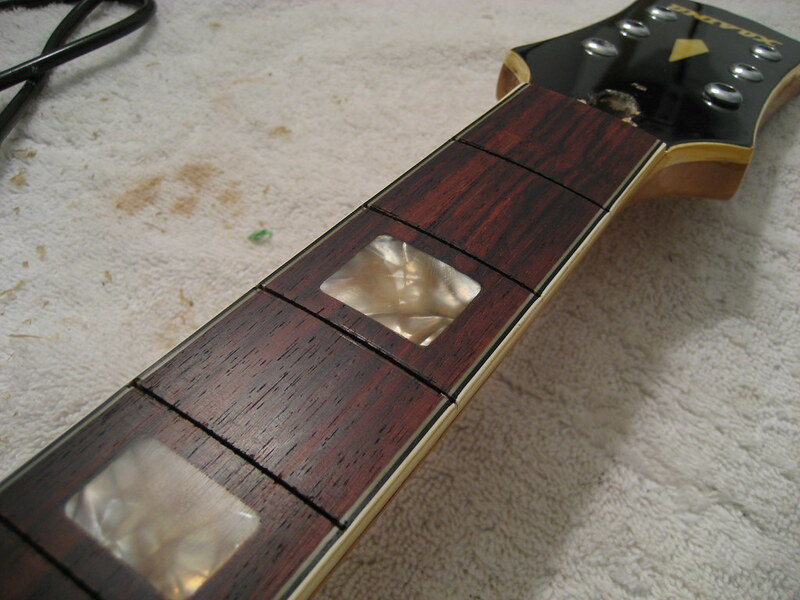 The main tell is that it will lack the grain, but for the little flecks that pop out around the frets it will look flawless. I'm in the process of building a Tele partscaster. After completing the Bassman I figured I just needed a new axe to go with it. After looking and playing lots of Fenders and seeing what the dollar bought, just thought I could spec my own for the same or even less. Figured I might as well rather than buy something and mod it out anyway. birddog wrote: After looking and playing lots of Fenders and seeing what the dollar bought, just thought I could spec my own for the same or even less. I did the same analysis and found quite the opposite to be true. If all the components are new, yes it gets pricey but how much can you salvage from old stock? That's what will give it a unique look and sound! Hey Buffalo Bill, how hard did you get hit by the lake effect this weekend? I'm near Valparaiso and we just got dusted a couple inches. Snow's not so deep yet, but it ain't stoppin' til late into the week! Have a look at our radar-49117. Here's a cheap way to shield a guitar, double stick tape and aluminum foil, works just as well as copper. Nice idea with the shielding Bill. Well as long as you don't need to solder any gound wires to it. I've been told you can get the copper from a Stained Glass window shop cheaper than some where like Stew Mac but I don't have one anywhere around. Aluminum and copper are equally effective for shielding guitar cavities. Or rather, equally ineffective. There's not really any point in carefully shielding the few inches of wire inside the guitar when the thousands of feet of wire in the pickup itself picks up everything you're trying to shield against.